Loro Parque has dedicated this week to the celebration of World Wildlife Day, which is celebrated worldwide tomorrow, March 3rd. A UN initiative, this year the event focuses on drawing attention to the Big Cats with the aim of raising awareness about the deterioration of populations of these animals in the wild. 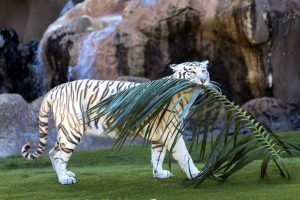 Loro Parque, well known for its efforts in conservation of biodiversity, has joined this important event by focusing the attentions on the big felines represented in the park: Lions, Jaguars and White Tigers. These animals act act as true ambassadors of the wildlife, representing their species and helping to raise awareness among the public about the challenges and dangers that these animals are facing in nature, mainly as a consequence of adverse human activities. Therefore, now more than ever, the role of a modern zoological garden is crucial to ensuring the conservation of these animals in the wild. Simba, Malika and Sarabi are the three Southwest African Lions that came to Loro Parque from different European zoos about a year ago. 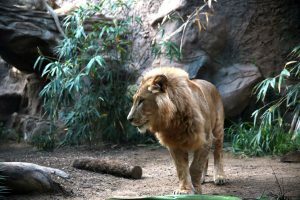 Here, they have an important role of acting as ambassadors of their peers in the wild, alerting the visitors about just how endangered this species is in the wild. In the last 50 years, the populations of lions in Africa have decreased from 100,000 to less than 25,000 animals. Due to land exploitation and deforestation, their natural habitat has been reduced to less than a quarter of its original size. Negra and Gulliver are the Jaguars in Loro Parque. Just as lions, these magnificent animals are perfect representatives of their species in nature. 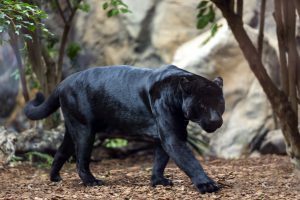 “Panthera onca” is a Near Threatened species, according to the International Union for Conservation of Nature (IUCN) Red List. The high rate of deforestation in Latin America is one of the biggest dangers that these animals face. The fragmentation of their habitats is a principal reason of isolation of these animals that makes them more vulnerable to human persecution. Every day, Yangyu and Linmao take a walk together in a majestic fashion on their Tiger Island. Both of them play a fundamental role in raising the awareness about the situation of tigers in the wild. Due to their colour, White Tigers find themselves very vulnerable in the wild and have difficulties surviving in nature.